I was recently invited to go on a special tour of the Colosseum, Roman Forum and Palatine Hill with LivItaly Tours – special because they’ve added VR glasses/goggles so you can see computer generated recreations of the sites while in them. 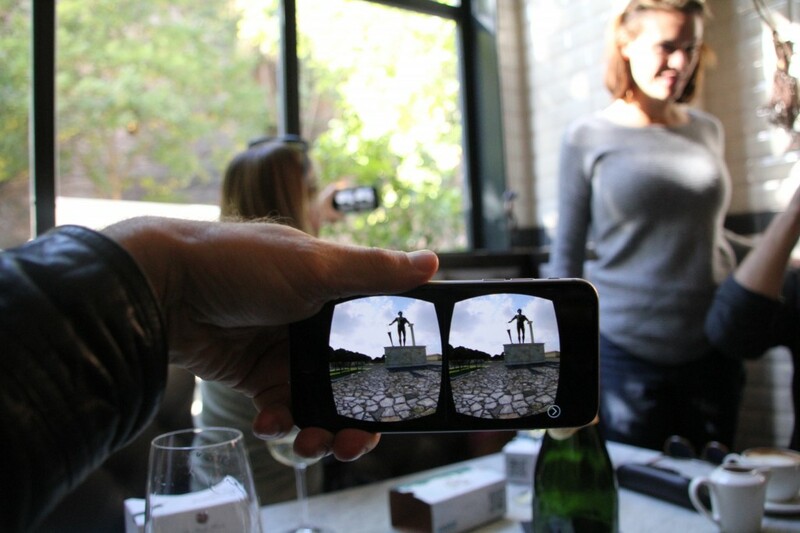 We – my 10-year old daughter and I – met with a group of other bloggers at the nearby Caffé Propaganda in the Celio neighbourhood, just next to the Colosseum, where we had a drink and demo of our glasses. They work with your smartphone through an app you download in advance. Once at a site, you select it in the app, and it recognises your motion, so as you turn the view changes. We started off at the Colosseum, talking about how it got its name and the colossal statue of Nero that was once next to it – and that thanks to the VR glasses, we could see again. Being on a group tour means jumping the substantial line, which even in November was pretty long. 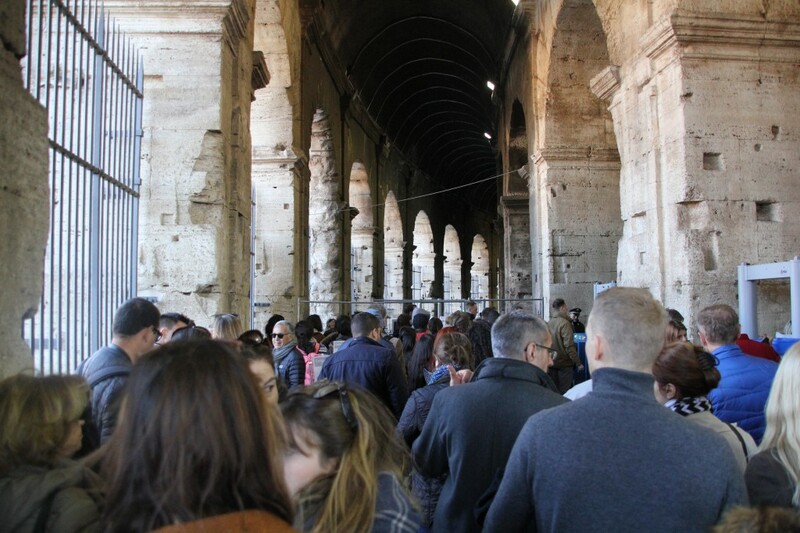 Now, I’ve been in the Colosseum many times, and have had a number of guided tours there too, but for my daughter, despite being born in Italy and living here, this was her first time. She’s currently studying the Greeks in school, so this was an interesting way for her to connect the dots to the ancient world. She was full of questions, and our guide, Rachel, was full of answers. The glasses were appealing to my daughter not only because of the cool/fun factor, but because many of the monuments and ruins from the ancient world require a lot of imagination to see what they were really like, and visualising them with the glasses makes it come to life much easier. 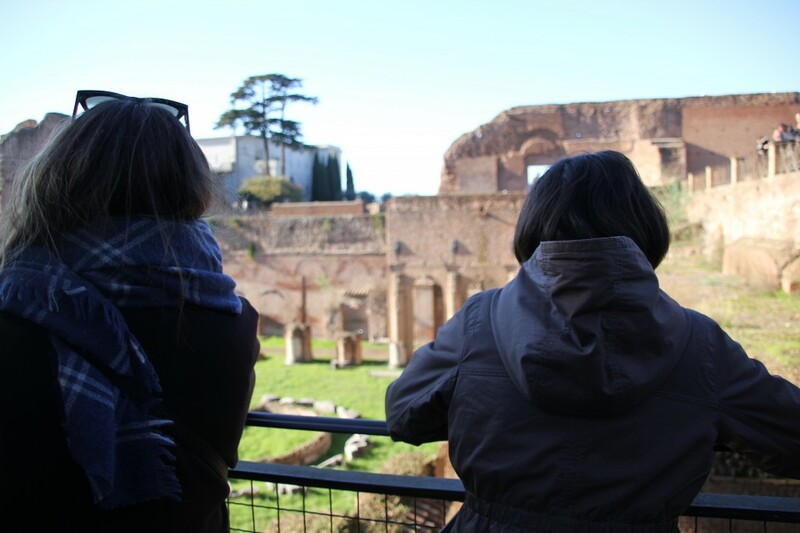 Next we headed up the Palatine Hill, where the emperors had their palaces, and saw over the Circus Maximus, the world’s largest sports arena. For the final part of the tour, we heading into the Roman Forum, once the downtown of the Roman Empire, and thus, kind of the center of the entire world. The entire tour probably lasted between 3-4 hours, and we were engaged the entire time. I’m a big fan of walking tours in general. 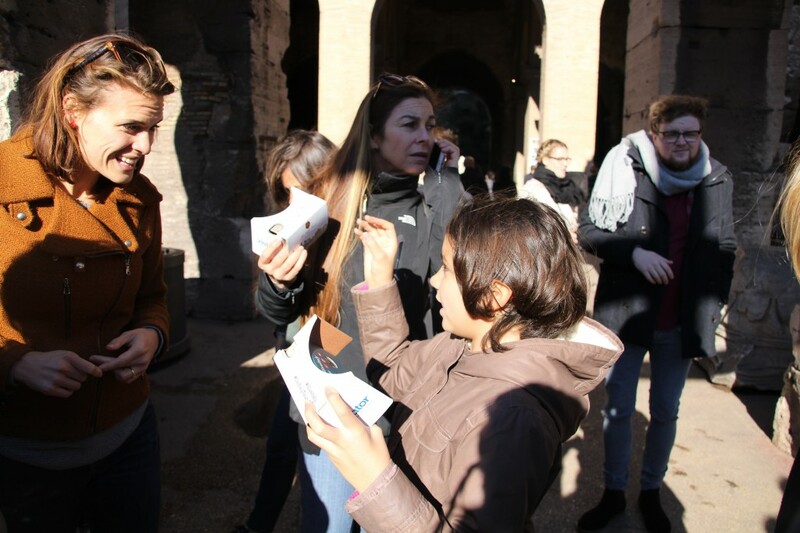 There’s a number of quality tour companies in Rome and in general they are all worthwhile – the more you’re able to invest, the more likely you’ll have a smaller group size and a more knowledgeable guide. Visiting many of these sites on your own, without any additional information or guide, can be an underwhelming experience, so I do recommend doing a tour. 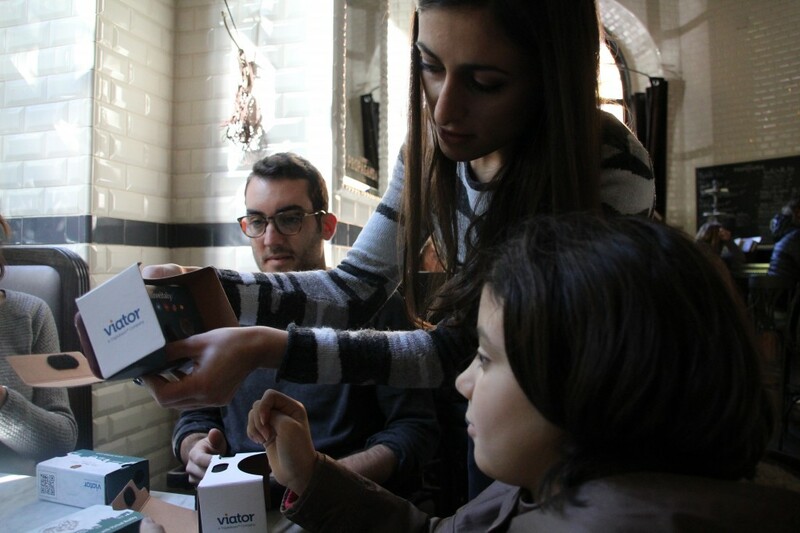 Having the VR glasses was a nice addition too, especially for kids, who can be hard to keep interested. I also felt that our guide was great with kids too – she was happy to get questions and visibly pleased to be able to answer them in a way that kept more questions coming. The price of their tours are slightly higher than other similar tours, due to the VR glasses, but you get to keep them afterward, and they work for other sites as well (and for other VR apps). They also offer a guide that’s full of recommendations that go behind the sites – food, markets, shopping, etc. 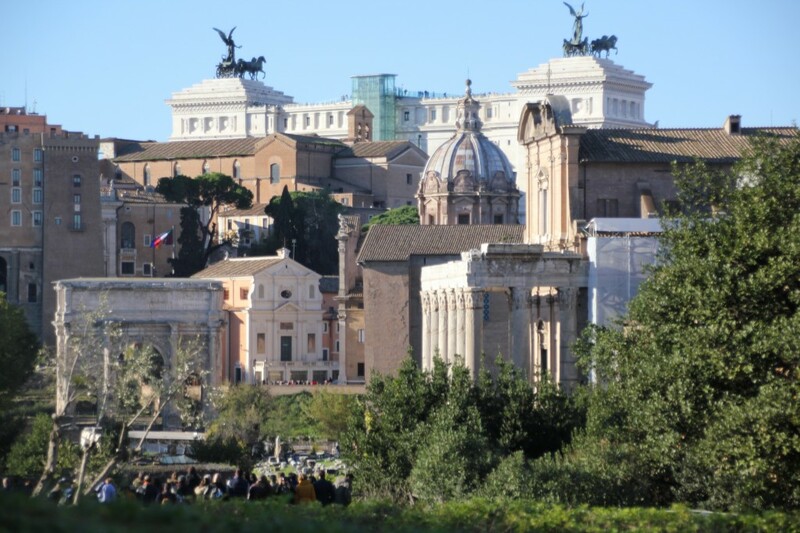 The Christmas holidays are a wonderful time to visit the city of Rome as a family, when the city is adorned festively on what seems like every corner and in every piazza, and the weather is typically still mild. 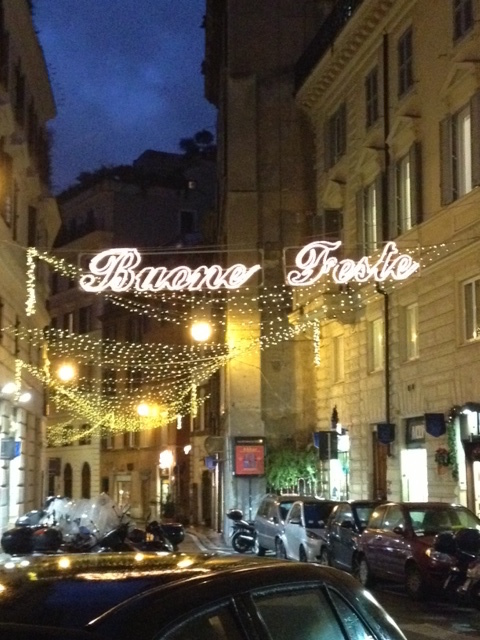 The season in Italy runs from around December 22 to January 6 on the Feast of the Epiphany. 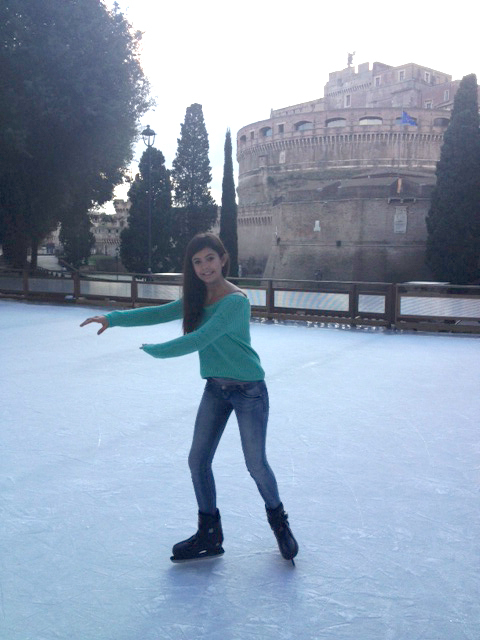 Another holiday family favorite in Rome is the charming temporary ice rink set up adjacent to the play park next to Castel Sant’Angelo, arguably the best “rink with a view” around. There is also a seasonal outdoor rink at the Parco della Musica, which is transformed into a Christmas Village with music, entertainment, an antique carousel, market stalls, and…of course Santa is there as well. The Christmas markets throughout the city, at Parco della Musica, and in other locales such as the Villa Borghese and Villa Celimontana, play stage to puppet shows and traditional musical performances during the season. 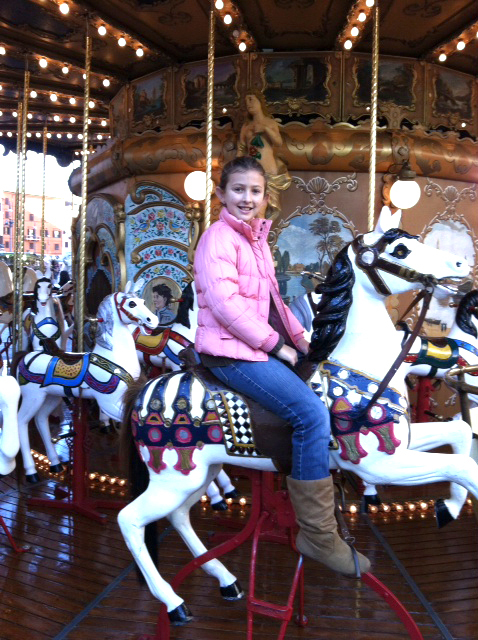 Check family event listings on Italiakids.com, Wanted in Rome, and In Rome Now for up-to-date information. In addition to the live Nativity scenes throughout the city, most famously in St. Peter’s Square, which is revealed at midnight on Christmas Eve, Piazza del Popolo hosts an annual show of hundreds of antique Nativity scenes (presepi) at the Sale del Bramante in the Church of Santa Maria del Popolo. Or the kids can make their own Nativity scenes and learn how Rome has celebrated the season since antiquity at the Arte al Sole arts and cultural holiday workshops in English near Piazza Navona while you enjoy some grown-up time shopping or lingering over lunch. As is the case with almost every season, many of your family’s memories will likely touch on food during your visit. Romans celebrate on Christmas Eve with a simple menu of fried fish and vegetables, and enjoy a long lingering lunch of roast meats the next day. Bakeries are filled with seasonal sweets and golden-hued cakes like panettone, pandoro, and the Roman pangiallo—so make sure to stop by the forno in Campo dei Fiori, not the least for the smell. Every dessert table will also likely be set with a welcoming bowl of juicy mandarins. On New Year’s Eve the city is itself a spectacle of music, street performance, and fireworks lighting up iconic views in sites that have hosted such revelries for several millennia, a chance for your family to make new memories while experiencing living history through Roman traditions of celebration. Shannon Kenny is Editor-in-Chief of Italiakids.com, an online resource for families traveling in Italy, Director of the children’s cultural program Arte al Sole, with 6 locations in Italy, and Founding Partner of Elaia Travel, a specialty travel concierge with expertise in family travel to Europe. Every year around April, Linda and I start to stress about the upcoming summer holidays, a time when the temperatures can soar to over 100°F/38°C and there are three months of summer holiday looming ahead and the dilemma of what to do with bored kids who can barely go outside it’s so hot. 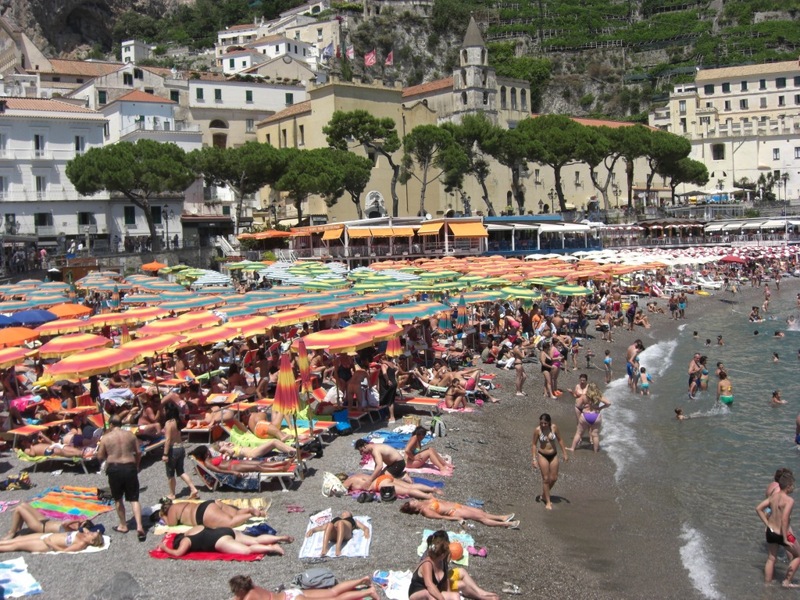 The beaches are crowded with escapees from the city, and rather than the natural refuge they should be, the beaches turn into a party scene filled to the brim with folding chairs, umbrellas and sellers of acquafantacocacolabirrasprite. A nice getaway in the countryside with a pool is out of the question because of sky high prices. Despite the fact that we live in a destination that many people dream of, the idea of being in Italy with the heat, the lack of interesting activities for our kids and all their friends away on holidays can be a real punishment for working parents here who have no family to fall back on. 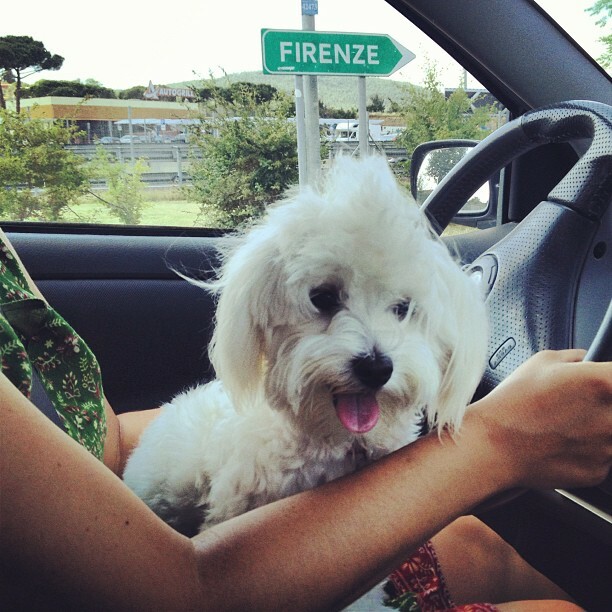 This summer we decided to take matters into our own hands and go on a road trip – a somewhat crazy idea for a family of 5 + dog with a tiny Toyota Yaris. We figured it would be fun to go with only a loose itinerary, and rather than focus on the destination, enjoy the adventure of getting there. 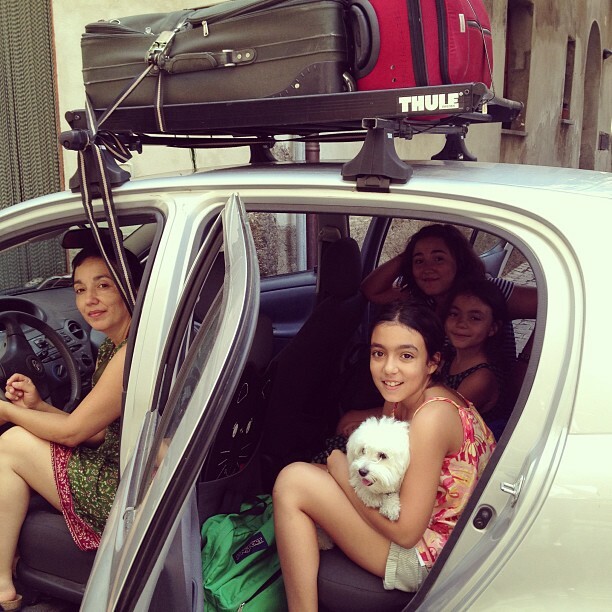 Saving money by not buying airfare for 5 was also an appealing factor. The Yaris packed up and ready to go. The day we discussed this idea, Linda and I were driving down the autostrada and at least 10 cars with Dutch plates passed us by. So we thought we’d do the reverse and drive up to the Netherlands. Surely we could find a Dutch family who would exchange apartments with us? We put the word out on Facebook, and ended up being offered a place to stay by friends in Amsterdam who would be away on holiday themselves (the Dutch get around!). 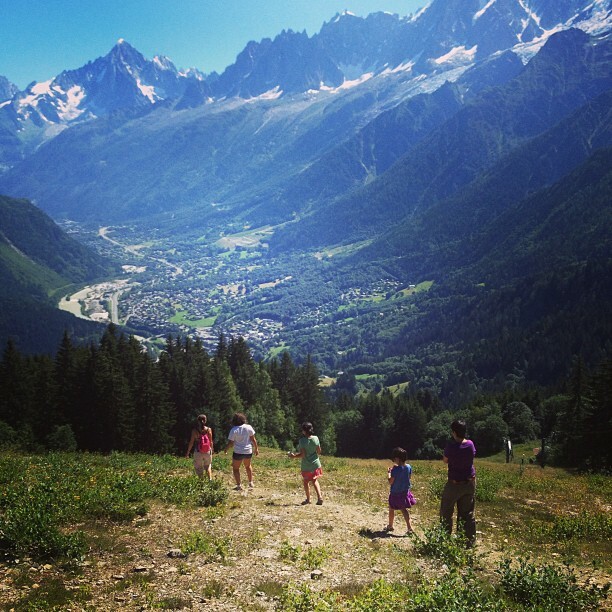 We planned our initial route through Chamonix, where we have friends; Cologne, where we have other friends; and EuropaPark, an amusement park we would hit on the way for my middle daughter’s 11th birthday. We figured we would wing it on the way back, maybe find another home exchange in Paris, or visit other friends who are in the Loire Valley, and come back to Italy by way of Ventimiglia, where a friend said we could couch surf. The trip lasted a little over of a month. 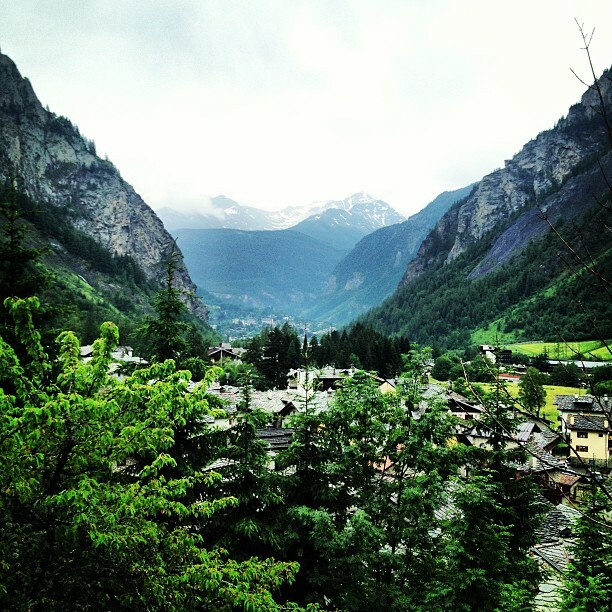 Driving around Europe is so different than taking the trains. With 4-8 hour stretches you have plenty of time to think. Here were some of my insights/observations about the trials and benefits of roadtripping in Europe. 1. Not having a departure time is really great. I hate the stress of trying to herd the cats kids and catch a plane on time, making sure you haven’t left a mess, or anything important, behind. With the car, you leave when you leave. You aren’t held to a tight schedule, and that can feel really good and very liberating. 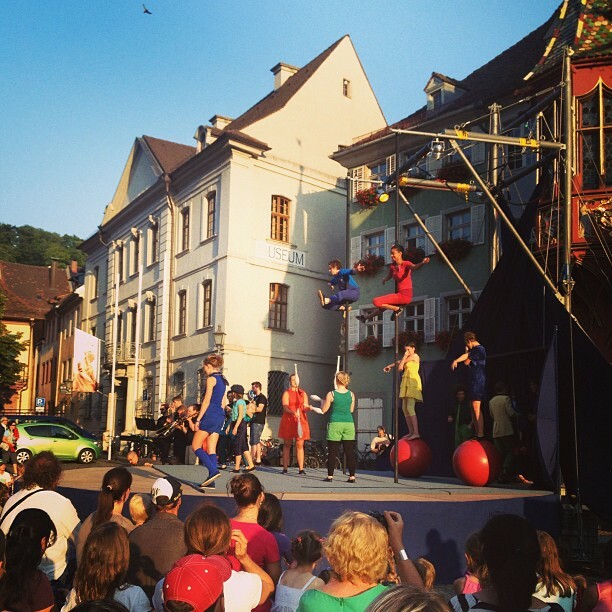 The girls were thrilled to come across a children’s circus in Freiburg im Breisgau. 2. You see how national identities change. As you cross a border, the language, food, customs and architecture changes entirely. Sometimes within the same country, like Switzerland, where you’re pretty much still in France at one point but keep driving and all of a sudden you feel like you’re in Germany, even though you’re still really in Switzerland. The experience reminded me of traveling by train when there were border controls and different currencies. It’s amazing to think how powerful this sense of national identity is – strong enough to have helped propel two world wars. 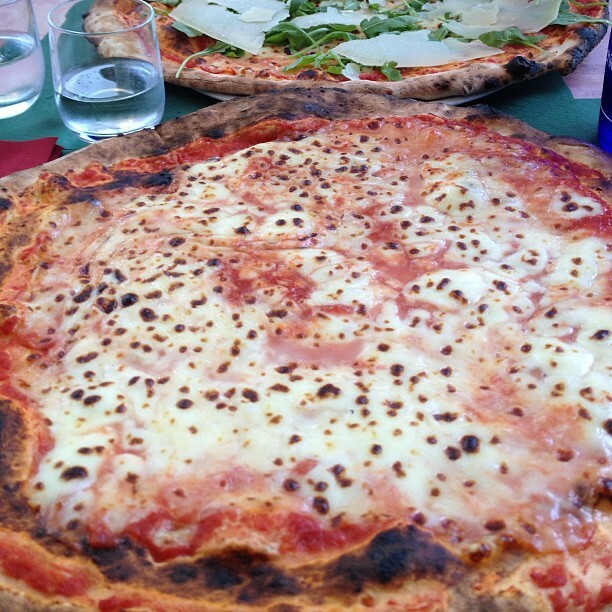 Pizza in Courmeyer, Italy. Cross 20 minutes through the Mont Blanc tunnel into France and the pizza is just not the same. 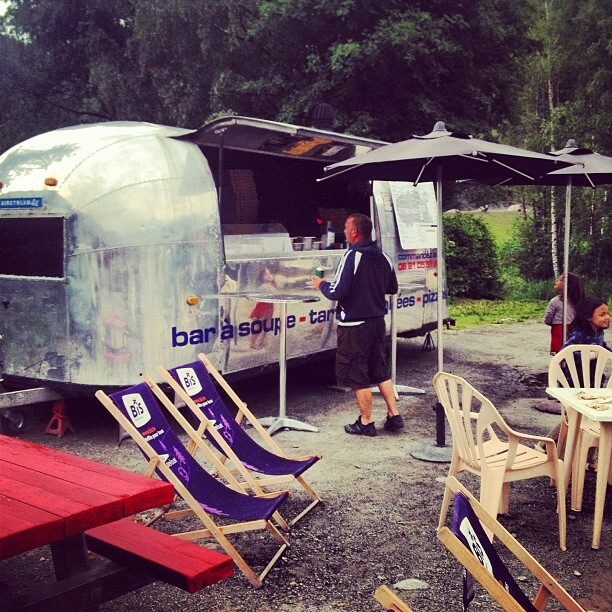 Wood fired pizza oven built out of an Airstream trailer in Les Houches, France. 3. There are many small towns that are worthwhile stops. We used the Osterie d’Italia guide to find recommended restaurants along the way and planned our breaks there while we were still in Italy. A quick google search would help us narrow it down. 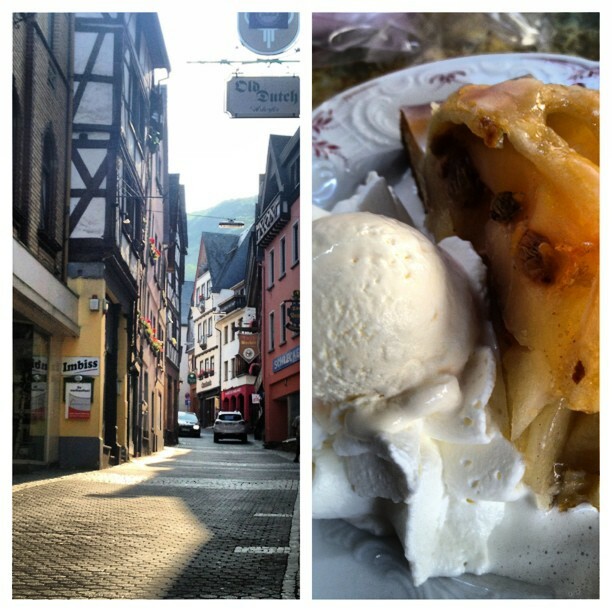 We found a cute town in Piemonte called Vercelli – the oldest inhabited town in northern Italy, known for its risotto; and meandering in Germany we came to the very picturesque town of Cochem and had some delicious apple strudel. 4. There might be savings, but it’s not cheap to drive! You save on airfare and train tickets, but man do you get hit by gas prices, tolls and parking! Filling up our small Yaris was about €60. Just passing through the Mont Blanc tunnel is €50 (it’s much cheaper if you buy a multiple entry pass). And parking in Amsterdam center was €4/hour 24 hours a day – a slight discount at night, but not much. (We had to park outside the city for the cheap parking and even then had to move our car every few days). 5. Difficulties in finding a place to stay. In this day and age, with smartphones, I imagined it would have been easier to just roll into town and find a good place to stay. Wrong. We were using the Booking.com app, Tripadvisor app, and even Airbnb and just found the whole process to be a pain. As much as I wanted to just wing it, I’m convinced there’s very little benefit not planning where you’re going to stay in advance and making a reservation especially when traveling with a family. 6. Keeping sane. 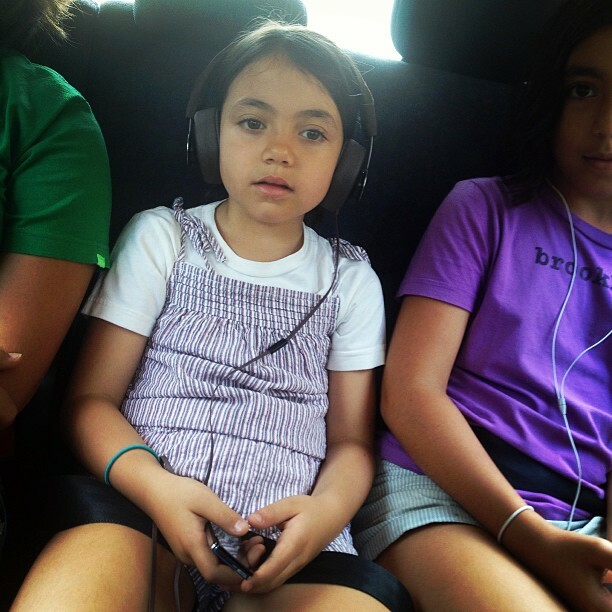 We downloaded audio books for our girls and that kept them calm and occupied. Remember to stop every few hours. I think 3-4 hours is a good time limit before having a decent lunch break and try to pack picnic style lunches if possible. In France, Germany, Switzerland, Belgium and the Netherlands, we found nice, clean rest stops with picnic tables, benches, etc. Unfortunately, this was not the case in Italy where we found ourselves eating in hot and dirty Autogrill parking lots with many of the remoter areas of the stops smelling like urine. 7. How to use technology to your advantage. The native map app for the iPhone actually keeps a GPS tracking signal even if you don’t have wifi or mobile network. This is great news for people with roaming issues – that is until you get off the route and the phone wants to recalculate and can’t which can be a problem if you run into some road works that have detours. We found connectivity issues in Germany, of all places, and some of the worst wifi I’ve ever endured in Amsterdam. We had a USB charger in the car to keep the phones and iPods going, and would have to rotate between them because the GPS app was sucking them dry pretty quick. It’s probably a good idea to have low-tech options as a back-up: a good map and a decent guide book for each region you’ll be in! We’ve been back now for over a month and every so often one of my girls will tell me about something from our trip they miss. 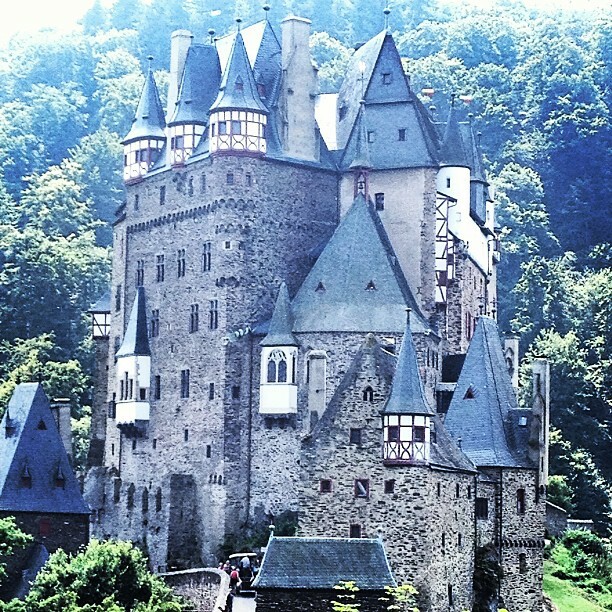 We traveled through 7 countries (but maybe Luxembourg, which you drive through in 30 minutes, doesn’t really count). We visited old friends, made new ones, ate different foods, tried new things, and actually all got along well in the process. 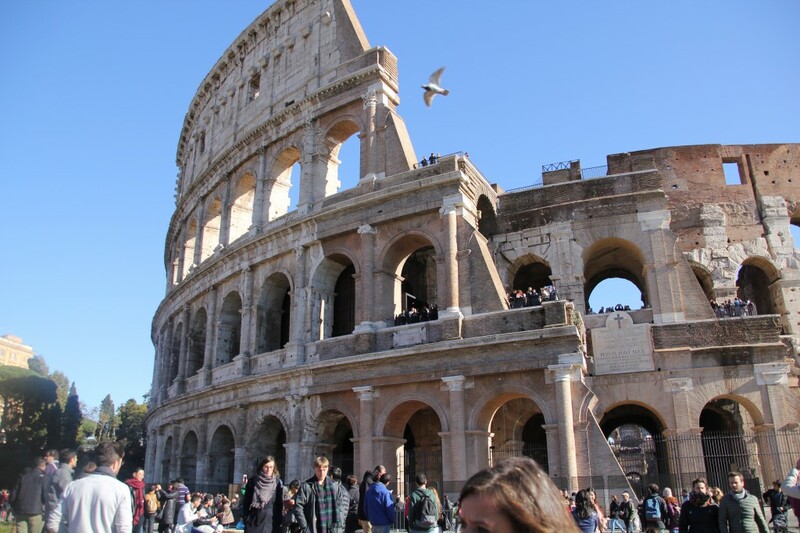 Baby gear – what to bring and what to leave at home when visiting Rome? You don’t want to be lugging around a bunch of extra stuff, and you really can’t count on your accommodation having anything other than an extra crib (you can forget about cabs having car seats either). Some “mom friends” have brought to our attention a great service called Travel Baby. They offer portable cribs, high chairs, different kinds of strollers, car seats, baby carriers, and even diapers and sheet sets for cribs. Their rates for each are based on number of days (there is one fee for 1-3 days; another fee for 4-7 days; and another fee for 2 weeks). 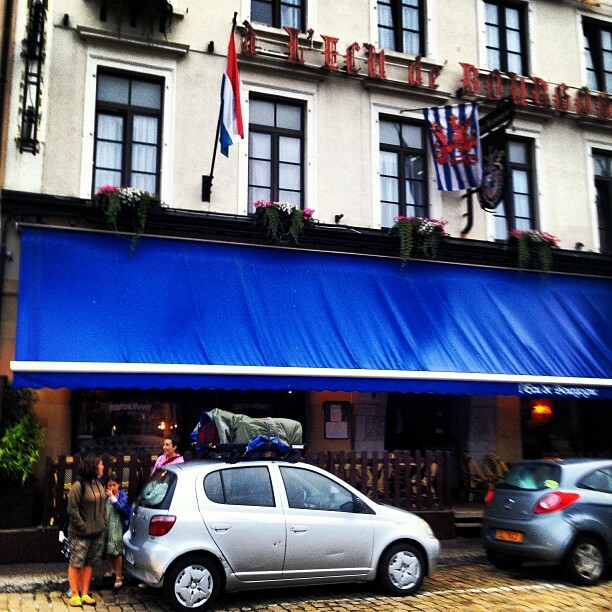 They drop off and pick up your rental items for free directly at your hotel, B & B, or apartment. They also offer babysitting services for those who need a little break from the kids (or kids who need a break from museums!). Upon request, they can find you an Italian- or English-speaking babysitter and rates vary from hourly to daily to even weekly. For a similar service in Venice, follow this link. What happens when everyone’s favorite travel writer is accused of food misconduct? Can the Food Police trio take on someone as untouchable as Rick Steves?